CRUSHIT Casino brand launched in 2017 with a sole purpose to offer top quality online casino gambling to US, Canadian and European Players. Built on the “Next Generation” casino software, CRUSHIT Casino is powered by the Lithium Gaming Platform. Lithium Gaming provides it’s operators with a massive selection of online casino games from top software providers like BetSoft, Rival, Nucleus, Supera and Spiromenal. With the ever growing demand for online casinos to offer a wide selection of top quality games, CRUSHIT casino offers a new approach to online gambling. This is especially true for US and Canadian casino players. CRUSHIT Casino is a US Friendly online casino site that now offers more than 200 more casino games than ANY other top US Casino. Currently this casino offers over 485 games which in comparison with other US Casinos that only offer 200-300 games on one software provider. The CRUSHIT Casino brand has a super hero theme, aimed to a target audience who enjoy the excitement of MARVEL comics. Captain CRUSHIT is the theme character behind the brand who help players achieve their optimal winning potential. New members who signup at CRUSHIT Casino are offered a sweet 50 FREE Spins to try out a few of their popular slots. To put this in perspective of value, CRUSHIT Casino basically gives $30 worth of FREE Spins to each new player. The Welcome package for real money players is just as attractive. 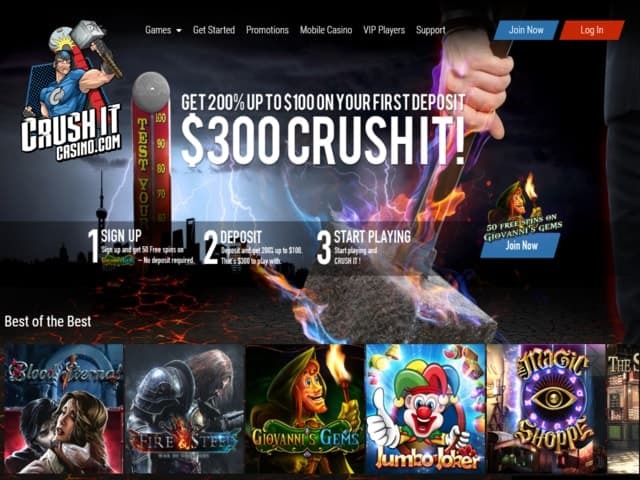 CRUSHIT Casino offers depositing players 200% up to $2000 on their first 3 deposits. This translates to $6000 in FREE bonus money that can claimed. Owned by Toft Management Groups Inc.m CRUSHIT Casino is managed by Vegas Affiliate Partners. The CRUSHIT Casino brand is part part the group of Next Generation casinos launched by Toft Management and licensed in Costa Rica. Toft Management group of Casinos also include LuckyBetz Casino and Mega Vegas Casino and will be launching more brands in 2018. Toft Management is a group of online casino veterans who have made it their focus to offer the very best online gambling experience. For many years, the European casinos have been leaps ahead of the Canadian and USA casino sites and so it is Toft’s mission to offer that same quality of online gaming to these markets. The game variety and casino quality of Toft’s casinos truly delivers Vegas entertainment to your home with class and excitement! As mentioned, CRUSHIT Casino offers a massive selection of games which are powered by Lithium Gaming platform. CRUSHIT members can choose from over 485 games from software providers such as Rival, Betsoft Gaming, Nucleus, Supera Games and Spinomenal. Vegas Affiliate Partners has also let us know that their casinos will have Live Dealer games added to their casinos in 2018. With 5 casino game providers, there is a huge selection of online slots at CRUSHIT Casino. A variety of richly animated video slots include story themed slots, adventure slots, classic slots and 3D slots. Popular slot games include Charms & Clovers, Mega Glam Life, Fruit Zen, Mr. Vegas and so many more. For casino players who are looking for table games, CRUSHIT Casino members can choose for a selection of classic casino games such as Blackjack, Roulette, Baccarat, Craps and more. Each of these table games have multiple varieties such as American Roulette and European Roulette as well as eight different types of online blackjack. If you’re more of a video poker player, then CRUSHIT Casino has you covered. This casino site has more than 20 different varieties of Video Poker to play. This online gambling site also has some bingo games, keno, virtual horse racing game and scratch cards for a little added excitement. At CasinoOnlineReview.com, our team all agree that the new CRUSHIT Online Casino does have everything an online gambler is looking for! Is CRUSHIT Casino Mobile Friendly? Yes, players at CRUSHIT Casino will have access to most of their online games to play on their mobile. Their site is responsive so there is no need to download an app. Players that access the CRUSHIT Casino via their mobile or tablet will have an optimized version of the site available to them. Their Mobile Casino offers most of the slot games as well as online Blackjack, Roulette and Video Poker games. Are Live Dealer Games Available at CRUSHIT Casino? At the moment, Live Dealer Casino is not available at CRUSHIT Casino, however we have been informed by the group that a Live Casino for their brands will be launching in the near future. One of the main reasons we have rated CRUSHIT Casino in our Top Online Casinos is that they have excellent customer support. Their friendly and helpful support staff can be contacted by Live Chat, Email, Phone as well as via Social Media messaging. Vegas Affiliate Partners understands the importance of top quality support, so they have made their support available 24/7 with the full customer satisfaction in mind. 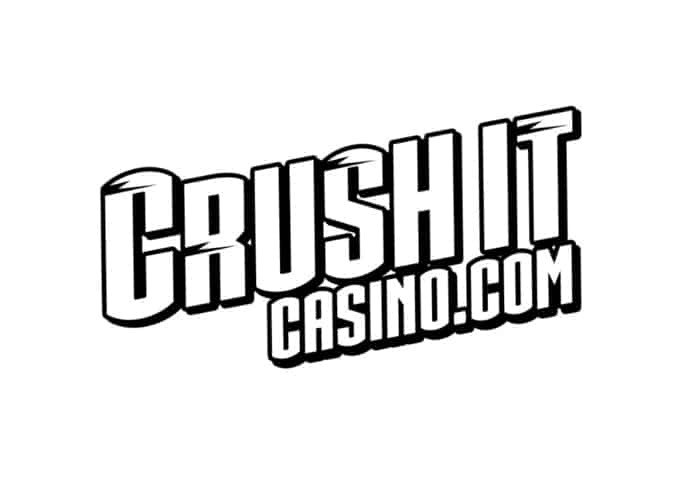 We test all our recommended online casinos deposit and withdraw mechanisms and our experience at CRUSHIT Casino so far has been smooth. Players can deposit using all major credit cards such as Visa, MasterCard, as well as UPay card. Please note: Some credit cards do not allow you to make an international transactions, so you may need to call your bank. CRUSHIT does also offer a Gift Card exchange deposit method. Players looking to deposit using cash methods can choose from WesterUnion and MoneyGram. They also offer crypto currency deposit and withdraw methods using bitcoin, Light Coin and Ethereum. Players looking to withdraw winnings can do so via Bank Wire, Check, WesternUnion, Moneygram, Upay Card, Bitcoin and Ethereum. NOTE: As per normal for US and Canadian players. Checks and Bank Wires withdraw methods can take 5-7 business days to receive which is standard processing time for any of our US friendly casinos. Members at CRUSHIT Casino can feel comfortable that their site uses SSL secure encryption technologies which ultimately protects player’s transaction data. Their systems are also protected by firewall technologies provided by McAfee and Norton. As for game security and fairness, The Lithium Gaming platform that CRUSHIT operates on uses a Random Number Generator (RNG). This RNG ensures that all game play is 100% fair and has random outcomes. Their RNG is thoroughly tested by 3rd parties and complies with all standards set by the online gaming industry. The team at CasinosOnlineReview.com love this new super hero theme from CRUSHIT CASINO. The site is easy to use, and with the largest selection of games we are confident that any online gambler will love this next generation casino site. On top of that, the management group behind Toft are very reputable with a long term focus on delivering a top notch online gambling experience. Signup today to try them out for 50 FREE Spins. We think you’ll like what you see. Don’t forget their 200% Deposit Bonus offer for your first three deposits!